The Scattered and the Dead, book 0.5, is part of a series of the same name. There are 4 books available in total at the moment which are numbered 0.5, 1, 1.5 and 2. According to the authors, the series is designed to be read in numerical order but it is fine to start at 0.5 or 1 also. The stories are brought to us from the minds of Tim McBain and L.T Vargas who hail from Michigan. 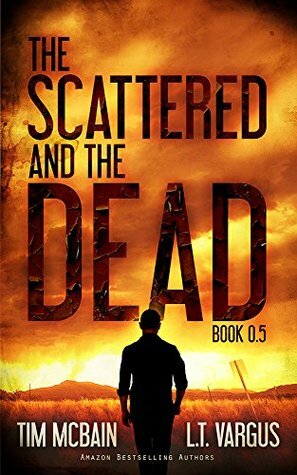 The Scattered and the Dead focuses on a very familiar topic in Horror fiction in that it is set in a pre, during and post apocalyptic world and yep, there are zombies. Of course there are. There are always zombies. While it can be seen as an over saturated topic, it isn’t overly saturated with good books. There are plenty of okay books, there are a few fantastic ones but there are a plethora of average to poor ones. The key, as it is with any good story, is grabbing the attention of a reader and having an interesting character or characters. Luckily for me, The Scattered and the Dead ticks both of those boxes comfortably. The first thing that stood out for me was the way it is written. It is first person but through written letters and entries into a journal or diary. You follow the story of John Decker (though everyone calls him Decker) as he starts by writing a letter to a girl who lives down the hall. This letter turns into letters and eventually into a sort of ongoing journal. Each chapter is an entry, some long and some short, and each entry gives you the pictures you need to start to understand the world and of course Decker too. The Chapters are also titled as a countdown, and then up, with Chapter 1 being 21 days before and the final chapter being 57 days after. I loved that too, especially the countdown, as it added a neat level of tension as you approached Day 0 with trepidation. So we learn that Decker is an introvert, I guess. A bit of a nerd and definitely a loner. He is intelligent though and has business acumen by the bucket load which I guess makes him not the typical character in these books. Decker is prepared, very well prepared, and even at 21 days before, he is buying supplies and stocking up on basics as the world starts descending into chaos. I liked that a lot about him as I instantly felt like this guy has a chance at survival here, well, he would if it wasn’t for one thing. His dread of going outside. He feels like he may have a small case of agoraphobia though it is just a feeling, not medically diagnosed, but we do learn that other than essential trips like hospitals, Decker has managed to avoid going outside for the best part of two years. So that is a brief insight into Decker, but what about the situation? What exactly is going on? Well, I don’t actually know which may seem a little odd. I have finished the story and I still don’t know. I have some ideas, some guesses even, but nothing I can say with any certainty. What I do know is that we join Decker at “21 days before” where we learn, through that first letter, of Decker reminiscing about saying goodbye to his mother while wearing a full hazmat suit to protect himself from infection. That little offering tells you that there is an infection, it is already out and that the government had some control of it. What we don’t learn here is how long ago it happened but I get the impression it was quite far back. Further into the letter we get a glimpse of now, and get to see how little control there is left as Decker mentions the news and reports of zombies in Florida and thousands of people bleeding to death. The count down continues and I am left wondering what to? We already know about the infection so what exactly is going to happen in 21 days time? As the letters continue we learn that the infection and the death is steadily spreading across the whole country and Decker starts to see people bleeding out from his apartment window. His internet and news watch reports to us of riots, looting and burning buildings and of more and more sick people. Full on end of the world is happening now, it’s outside his window, and what does Decker do? Well he writes – he stays indoors and writes his letters. As we would expect, he eventually loses power too and takes that quite hard. He depends heavily on television and the internet, not just for information, but almost as his connection to other human beings. He obviously also depends on it to run his freezer but it is the connection part he seems to be more upset about. Day 0 arrives and well, you can read what happens for yourself. I won’t spoil it here as I really feel the countdown adds so much to this story. It isn’t even what happens that matters, it is the countdown to something happening that pulls you in. Soon afterwards the water pressure starts dropping and Decker realises he is soon going to have to do something that he really would prefer not to – he is going to have to venture outside. Decker does slowly start going out – using his apartment as ground zero, he ventures further and further each time. He starts by going apartment to apartment, gathering supplies, and eventually decides he is ready to leave the apartment behind for good. He remembers an old radio broadcast which detailed a military safe zone and not long after kind of accidentally decides to head there. Anyone who reads these sort of books will know that military safe zones are not the place to be in these events but where else can he go? He may be the last man alive outside of these zones? He may not even be able to make it there but he has to do something right? One thing that is certain, his journey there won’t be easy. One of the things I enjoyed the most about this story is how much of it is left for you to picture. The journal style allows you to read between lines and therefore add levels of depth to characters and places that may not always be there when a description is purely dictated to you. It also adds a sense of realism and feeling to Decker as you read his words, feel his growing despair and will him onwards. The world it is set in, is far from unique. It is a city, an infection, there are dead bodies, no power and no water but it is in the character himself that you find the uniqueness in this story. It is odd, but in a good way,. to have finished the whole book and still not be sure exactly what happened, how the infection started or even if it really is an infection or what actually really happened on Day 0. That also comes from having purely one singular perspective to get your information from. There are no overhanging paragraphs providing you with god like knowledge – it is purely Decker’s words that you have to go on, purely his perspective we read and his eyes and mind that we see through and that connection, that trust you need to have in a character is special. A very enjoyable story but the beauty of it is really in the telling. I love that the reader is trusted to see what is happening without having it rammed down our throats constantly. Through Decker’s words there are some horrific descriptions of the death he has seen which definitely add to the horror element of the book too. It is an intriguing book, skirting around the edges of what is going on but giving you subtle hints here and there to keep you intrigued and I am, intrigued, that is. Enough that I plan to pick up the next book in the series right away. Right now, the authors are giving away this excellent short novel for no cost at either the website of Tim McBain or LT Vargas. There is no better value for money than that so why not give it a go, you may love it too. The rest of the series is available from the usual sources such as Amazon as well. Check out both authors websites in the links above for more information or why not give them a like on Facebook or follow on here Twitter – Tim or here Twitter – LT or preferably both?